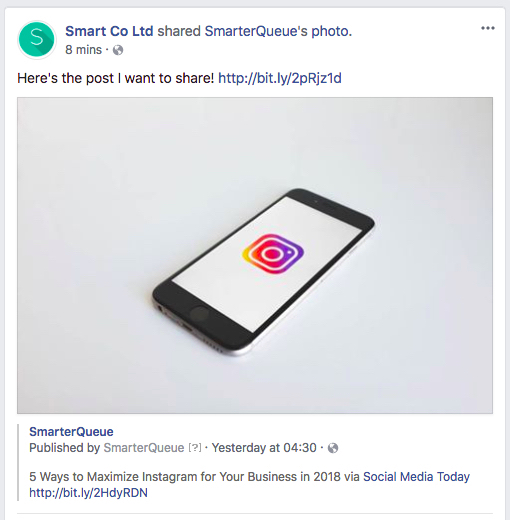 SmarterQueue can’t do native re-sharing just yet, but there is an easy workaround that will allow your re-shared posts to appear correctly on Facebook and Twitter. You can re-share your own or anyone else’s Facebook content. Unfortunately, if you use link tracking, Facebook won’t be able to show the original content – it will only show an empty preview of a Bitly link. 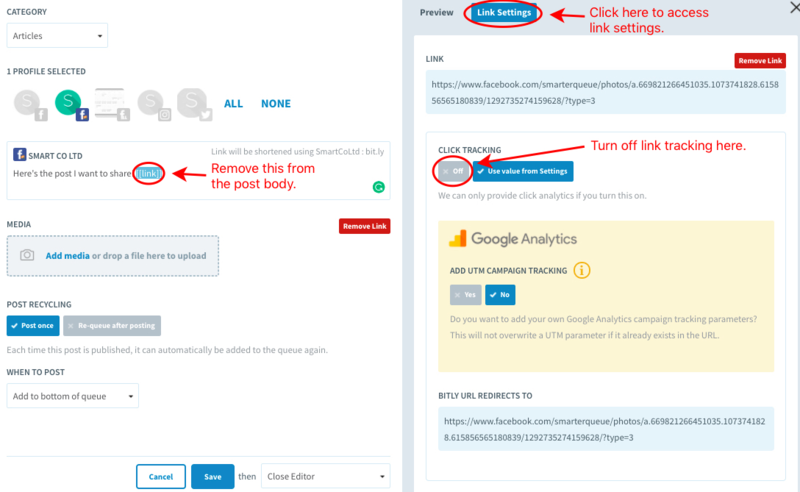 All you need to do is turn Bitly (link tracking) off when sharing a native Facebook link. This will force Facebook to post the image/video and description as if you were posting directly through Facebook.com. You should remove the word [[link]] from the post text so that the Facebook URL doesn’t show up, only your shared content. Find the post on Facebook that you’d like to share. Right-click on the date of the post, and choose Copy Link Address (of the original post on Facebook). Go to SmarterQueue and navigate to Add Content > Add a Post. Paste the link you just copied into the post text, and wait for the link to be processed. Remove the [[link]] from the post text. Click on the blue Link Settings button, and turn Click Tracking to Off. Select Use link preview from the Link Preview options. Note: While you won’t get an accurate preview in your Queue for how the post will look it will post correctly on Facebook. You will also lose the click tracking, but you may be able to get click stats from Facebook’s internal analytics. You can re-share any tweet (including a Twitter video) by copying and pasting the link to the tweet at the end of your tweet. You do need to make sure that click tracking and UTM are turned off in the Link Settings. Find the post on Twitter that you’d like to share. Click anywhere in the tweet to maximise it. Copy the tweet URL from the address bar. Go to SmarterQueue and navigate to Add Content Add a Post. Paste the link you just copied into the post text, and wait for the link to be processed. Note: While you won’t get an accurate preview in your Queue for how the post will look it will post correctly on Twitter. You will also lose the click tracking, but you may be able to get click stats from Twitter’s internal analytics. Why can’t I see a preview when sharing Facebook content? There is a known limitation with Facebook when posting links shortened with bitly, that all scheduling tools will face. 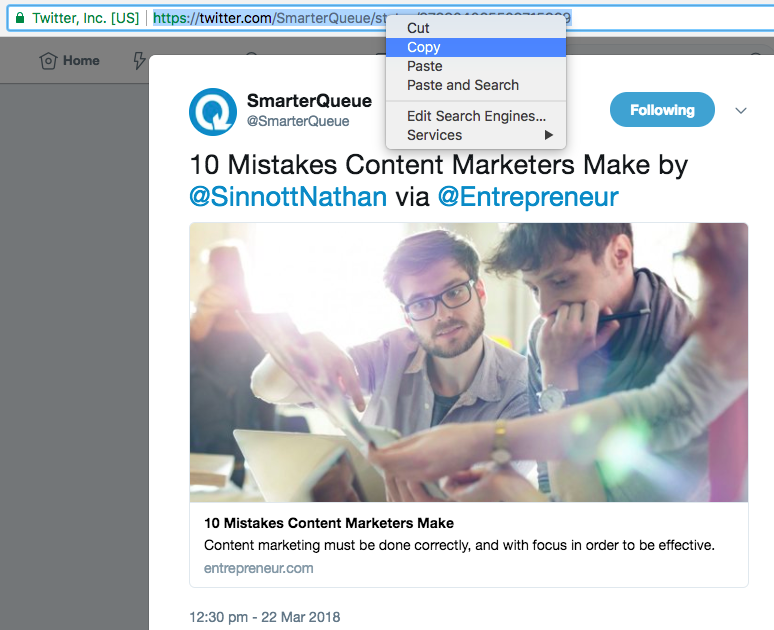 Normally, when you share a link to a web page, the page contains a title, description, and preview image – which we use to generate the preview inside SmarterQueue. However, Facebook does not provide those preview details for any Facebook content, so we can’t create a preview image or description. You’ll see the same behaviour if you try posting via other tools like Buffer. Why can’t I see a preview when sharing Twitter content? There is a known limitation with Twitter when posting links shortened with bitly, that all scheduling tools will face. Normally, when you share a link to a web page, the page contains a title, description, and preview image – which we use to generate the preview inside SmarterQueue. However, Twitter does not provide those preview details for any Twitter content, so we can’t create a preview image or description. You’ll see the same behaviour if you try posting via other tools like Buffer.